Understanding the Zodiac: and why there really are 12 zodiac signs, not 13. 15th century woodcut from Sacrobosco's Sphaera Mundi showing the zodiac as a belt extending 9° either side of the ecliptic. This is the belt within which (as seen from the Earth) all visible planetary movement occurs. BBC explains how false rumours that zodiac signs have changed spread rapidly (because of other media agencies) whilst failing to point out that the other media agencies that spread the story used the BBC's information as their source. Due to the influence of BBC content as it circulates through media networks, the internet is already ablaze with sensational news reports such as The Independent newspaper's "Astrological signs are almost all wrong, as movement of moon and sun throws out zodiac", (which adds "astronomers also reveal an entirely new star sign"); and Australia's news.com.au's "Why your entire life is based on a lie" (which adds: "There is also a mysterious 13th sign that was dropped for an unknown reason"). To be clear, these ridiculous remarks have absolutely no foundation. The reasons why the zodiac has 12 signs and not 13 are well known, and there is no mystery as to why Ophiuchus is not amongst them. The technical basis of zodiac construction is not an easy subject for the public to digest, but the questions and answers below explain the issues as simply as possible without removing any important, pertinent details. (To understand the divisions of the zodiac, it is necessary to understand what the zodiac is, astronomically). Why is the zodiac divided into twelve equal divisions, rather than any other number of equal or unequal divisions? Is a zodiac constellation a star sign? If not, why not? Why does the BBC tell us "The astronomical zodiac actually contains 13 star signs - the 12 that we're familiar with plus another one, called Ophiuchus"? Why is news of a 13-sign zodiac like an urban myth that keeps circulating, even though it is not true? Why does the BBC webpage say "an astronomical phenomenon, unknown at the time, means that the constellations have all drifted"? Is this correct? Does the number, size or boundaries of zodiac signs ever change? What are the two different zodiac systems? Doesn't having more than one zodiac system prove astrology to be groundless? The zodiac has historically held great astronomical, astrological and calendrical significance. It is not physically "real" in itself, but created by mathematical division of the ecliptic. To understand the zodiac, it is necessary to know what the ecliptic is. The ecliptic is the astronomical circle that tracks the Sun's annual interaction with the Earth. Ancient astronomers measured the year by watching how the Sun makes an annual cycle against a backdrop of certain star-groups, and they defined the calendar according to the Sun's progress along this circle. (The ecliptic is often referred to as the Sun's "apparent path" because the Sun appears to move around the Earth, and zodiacal measurement along the ecliptic historically adopted a geocentric perspective). 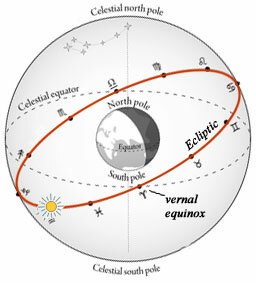 The ecliptic is a line (or circuit of space) that cuts through the equator at an angle of about 23½°. It takes its name from the fact that every six months, when the Moon crosses the Sun's path at a New or Full Moon, the Moon lines up exactly with the Sun and produces eclipses. The angle between the ecliptic and equator is the reason the Earth experiences seasons. When the Sun is on the part of the ecliptic that crossses the equator, day and night are equal all over the world, so these intersection points are called "equinoxes" (Latin: aequus, "equal" + nox, "night"). The movement of the Sun from below to above the equator sets the astronomical definition of spring in the northern hemisphere, because daytime then becomes longer than nighttime. Around 2000 years ago this equinox, traditionally called the vernal equinox (Latin: ver, "spring") was chosen to be the starting point for measurement through the zodiac. It is called the "zero degree", or "0° Aries" because Aries is the first of the twelve signs of the zodiac. The zodiac is a belt of space which extends 9° either side of the ecliptic.4 It is a small but extremely important band of space, because as we view the sky from the Earth, all the observable planetary activity in our solar system takes place within this narrow celestial belt. The reason for this is that all the planets in our solar system (including Earth) remain on a similar plane of orbit whilst revolving anticlockwise around the Sun. The consequence is that the constellations that lie in this part of sky have always been of particular interest to astronomers and astrologers, because their stars form a backdrop against which the altering positions of planets can be observed. 1) Diagram showing how all the planets in our solar system orbit the Sun on a similar plane of revolution. Pluto (invisible to the naked eye and now demoted to dwarf planet status) is a notable exception because of its eccentric plane of revolution, at a 17° angle to the ecliptic. 2) Illustration of the how the Earth is encircled by the zodiac, from Andreas Cellarius, The Celestial Atlas, or the Harmony of the Universe, 1660. For the same reason there are twelve calendar months in a year. The zodiac is a circle which maps out the Sun's position throughout the year. The year has 365 days, the ecliptic, as all circles do, has 360 degrees (a number attributed to the circle by the ancient Babylonians to facilitate correspondence of the solar cycle with the calendar: 365 is not easily divisible, 360 is the closest number to it that is, and its divisions make easy correlation with many astronomical cycles). Hence the zodiac adopts the general template that is used in all calendars: there are four major divisions, defined in the zodiac by four equal quarters separated by 90°, which determine where the ecliptic intersects with the equator to create the astronomical commencement of the four seasons. Each of these quarters is divided into three signs measuring 30° each, to correspond the Sun's movement through the zodiac with the 30 day/one month period it takes for the Sun to move through those 30°. 1) Andreas Cellarius' illustation of the geometrical replationships in the zodiac (The Celestial Atlas, or the Harmony of the Universe, 1660); the metaphysical meaning of these relationships contributes to the astrological understanding of planetary relationships. 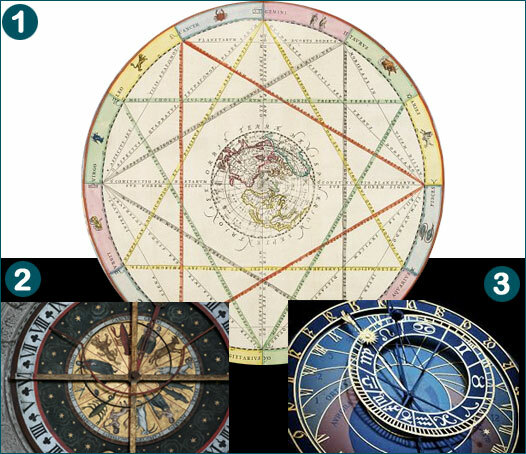 2 and 3) Many European clocks demonstrate the essential connection between the zodiac and the passage of time, the zodiac being able to offer reference for minutes, hours, days, months, years, and even greater cycles. Illustration 2 shows the zodiac clock at Chartres Cathedral, France. Illustraion 3 shows the zodiac clock at Prague, Czech Republic. A constellation can be visibly seen. It is a grouping of stars that appear together in the sky, as the word constellation suggests (it derives from the Latin con, "together" + stellas, "stars"). A sign communicates information. Zodiac signs, sometimes popularly called "star signs", are determined by astronomical principles. The astronomers who originated the zodiac system also worked as astrologers and sought to attach and extract more than purely astronomical information from them; however, zodiac signs never have, and never will be visible - nor are they expected to make a close astronomical aligment with the constellations whose names they share. This would not be possible because constellations vary greatly in size whereas zodiac signs do not. It is worth considering that when the Babylonians developed their zodiac they recognised 18 visible constellations that lay in the area measured by the zodiac (some accounts list 17 constellations, others list 18). The reduction of the number of their constellations was done over time to facilitate astronomical measurement, and in response to the increased importance of the zodiac. But note that the constellation boundaries were adjusted to ease association of constellations with zodiac signs, not vice versa. 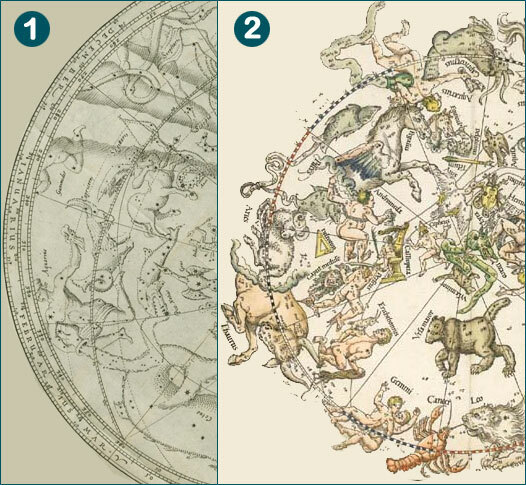 The 12-fold design of the zodiac is never changed to reflect alterations of constellation boundaries. 1) Detail from Isaak Habrecht's 1666 edition of Planiglobium coeleste ac terrestre showing how the 12-fold division of the zodiac overlays constellations of various sizes, (courtesy of Echo Cultural Heritage Online). The outer rim shows how the degrees of the zodiac relate to the days and months of the calendar. The pronounced dotted line that runs through the constellation figures marks the ecliptic. 2) Illustration of constellations that lie on the ecliptic (the outer circle) by Albrecht Dürer, 1515. Note how some constellations, such as Gemini and Cancer, act as joint background constellations for the same division of the zodiac. This information is incorrect and based on Dara O Briain confusing constellations with star signs, and also failing to distinguish between the ecliptic and the zodiac. What would be correct to say, is that the ecliptic passes through thirteen constellations. These do not constitute star signs. Following the redefinition of constellation boundaries by the International Astronomical Union during the 1930s, the ecliptic currently passes through thirteen officially recognised constellations: the twelve constellations historically described as "zodiac constellations" (because either the whole or greater part of them falls within the zodiac belt), plus the constellation Ophiuchus, which mainly lies outside it. 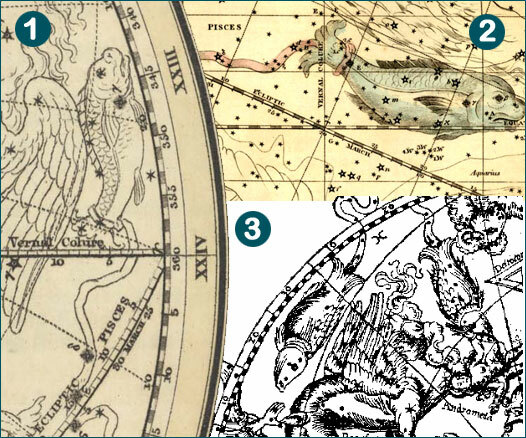 Regardless of where the boundaries of Ophiuchus are placed, astrologers have always taken meaningful associations from the stars of this and other constellations. Astrological interest focuses on the brightest and most culturally significant stars in the sky, and the meaning attributed to them has been acquired over many centuries. This long-established meaning is not lost according to what division of the zodiac a star falls in, or if the boundaries of the constellations are adjusted, although this might give rise to new cultural associations that become meaningful for astrologers over time. [For the astrological meaning attributed to Ophiuchus and its stars, see here]. 1) Plate 9 of Alexander Jamieson’s Celestial Atlas (1822) showing the constellation Ophiuchus, and illustrating how only the lower extremity of the constellation figure crosses the ecliptic. 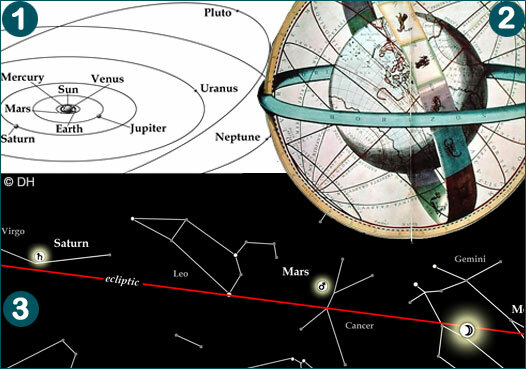 I have highlighted the ecliptic line in red to make it clearer. The constellation's most significant star, Ras Al Hague, is also highlighted. This has a celestial latitude of 36° north - 27° beyond the limit of the zodiac belt. The BBC has a habit of raising this story to promote their astronomy programmes and in many ways has acted as the source of it. The astronomically incorrect description of Ophiuchus as an "astrological sign" first drew prominent media attention in Britain on 20th January 1995, following the BBC's Nine o'clock News announcement that "an extra sign of the zodiac has been announced by the Royal Astronomical Society". The story made the headlines of the Times and Telegraph the following morning. News of this supposedly 13-sign zodiac quickly travelled across the world, being featured (on the strength of the BBC's reputation) on NBC news in the US, and making countless sensational newspaper headlines throughout Europe, Canada, Brazil and Australia. Investigation into the source of the story revealed there had been no such announcement.11 The BBC had merely misreported the International Astronomical Union's old decision, in the 1930s, to alter the officially recognised boundaries of constellations that cross the ecliptic. The Nine o'clock News announcement was made as part of the BBC's promotion for a forthcoming programme on astronomy that featured the zodiac and explored the issue of precession of the equinoxes (a technical theme that few members of the public would be likely to get excited about without some kind of public interest attachment). Despite complaints, the BBC made no attempt to set the record straight or explain why their highly profiled news story was so factually flawed and misleading. The zodiac is no longer a preferred system of astronomical measurement, so many individual astronomers who comment on this matter make no use of it, and have a poor understanding of its history, definition and purpose. Many have been influenced by these kinds of sensationalised media reports, and so do not realise how inappropriate it is, astronomically, to refer to a constellation as a "star sign". Many more will now be influenced by the BBC's new webpage, which was published in assocation with the BBC's Stargazing Live astronomy programme, and presents content that appears to be shaped by their own promotional interests rather than educational purposes. Why does the BBC website say "an astronomical phenomenon, unknown at the time, means that the constellations have all drifted"? Is this correct? Does the number, size or boundaries of zodiac signs ever change? Update: in response to complaints that precession of the equinoxes was patently not an "unknown phenomenon", the BBC removed this text from their webpage on 27/03/15. Unfortunately, the inaccurate information continues to be spread by other sites that recirculated the BBC's original information, and the rest of the BBC content remains, even though the theoretical argument used to support it is no longer presented. The development of the zodiac as a tool for mathematical astronomy became complete over 2000 years ago. The zodiac does not change, or shift the number or size of its divisions, but what does change is its associated starting point, the vernal equinox, as measured against the backdrop of visible constellations. This is because when the Sun returns to its zero point as it crosses the equator each year to commence spring, it does so at a point 50 seconds of arc to the west of it. So there is a very slow, almost imperceptible, backwards precession of the zodiac against the visible constellations. Contrary to the BBC report, this phenomenon, known as "precession of the equinoxes", has been known about since ancient times. The Greek astronomer Hipparchus discussed it, and Plato alluded to it poetically. Its impact on the calendar, and how zodiac measurement incorporates recognition of its effect, is clearly explained in both the astronomical and astrological works of Ptolemy (2nd cent. AD).14 The latter, Ptolemy's Tetrabiblos, is considered the most historically important and influential astrological text ever written, because of the position of respect that Ptolemy held in the ancient world, and the way his work set out reasoned arguments to intellectually justify astrological principles such as this. In many respects, knowledge of precession is a fundamental principle of the zodiac system used in the west. Allowing the starting point of the zodiac to slip backwards against the framework of visible constellations is an astronomical necessity for keeping the zodiac aligned to the seasons (so the zodiac sign Aries remains associated with the temporal qualities of spring, denoting growth and high energy, etc., whilst Capricorn retains association with mid-winter, and so signifies the qualities of preservation and reserve). Although the rate of precession is so slow that it is hardly recognizable within one lifetime, the shift accrues a difference of about 1° degree of the ecliptic every 72 years. This means that classical astronomers noted the zero point of the zodiac to fall near the end of the visible constellation Aries, but in medieval times it was noted to fall near the middle of the constellation Pisces. The zero point is currently shifting into the beginning of the constellation of Aquarius (hence the song: "this is the dawning of the Age of Aquarius"). There will be a complete revolution of the zodiac against the background constellations over the course of 26,000 years. This is astrologically known as the cosmic "Great Year" and is described by ancient philosophers as the most significant astronomical cycle to effect the Earth. According to ancient astrological theory, its completion is supposed to bring a great return of experience, where one "age" of civilization ends and another begins. 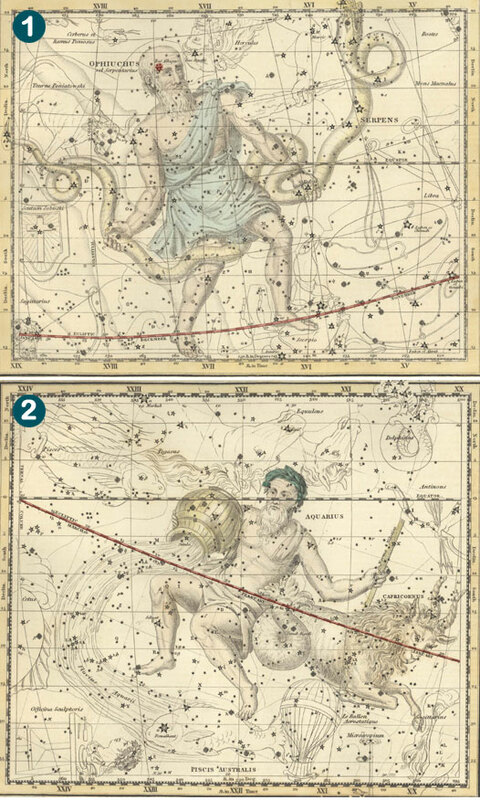 1 and 2) Alexander Jamieson’s Celestial Atlas (1822). By far the majority of astrologers in western civilizations expect the zodiac to commence from the degree of the vernal equinox. This sytem, whilst its starting point slowly revolves through the visible background constellations, maintains alignment between the zodiac signs and the calendar, so its associated meanings are deeply affected by seasonal change and the qualities of time. As previously explained, precession causes the starting point to revolve through the entire background of stars over a period of about 26,000 years, so this zodiac is known as the tropical zodiac (from the Latin tropicus, "turn"). The Greek astronomer Ptolemy wrote about the theoretical need for the zodiac to maintain its starting point with the intersection of the ecliptic and equator, and much of his astrological work demonstrates incorporation of seasonal effects, such as in the symbolic assessment of "humours" and "temperaments". It is often reported that Ptolemy invented this zodiac system; he didn't, he described an approach that was conventional in his time, and which is explained in detail in the older text of the Greek scientific writer, Geminios (c. 1st cent. B.C.). It is hard to overstate the massive historical impact this zodiac has had on Arabic and European art, culture and science, with most people expecting the zodiac to set the framework of their working year and planning their activities to co-ordinate with it. Reference to the zodiac never faced historical criticism on theological grounds. Even important church leaders who criticised the use of astrology for making fatalistic predictions supported reference to the zodiac as a means to judge how the quality of time at birth leaves its imprints on temperamental disposition and physical health. The theoretical problem that the tropical zodiac faces, is that its seasonal associations are designed for the experience of life in the northern hemisphere: there is no allowance for how mid-summer in the northern hemisphere is mirrored by mid-winter in the southern hemisphere. One supporting argument is that the tropical zodiac relates to an overall global experience, the greater landmass of the northern hemisphere meaning that, as a whole, the earth greens and grows at the time of the vernal equinox, and experiences a cycle of seasonal changes that accords with the principles of the zodiac. An alternate system of zodiacal reference, widely employed by Indian astrologers, (often known as Hindu or Vedic astrology)13 and also adopted by a growing number of western astrologers, aims to keep the zodiac permanently aligned with the underlying constellations, and so loses the symbolic connection of the zodiac signs with the seasons of the year. This is known as the sidereal zodiac, because its underlying principle is to maintain a fixed point of reference that commences from an astronomical association with one of the stars (Latin: sidus, star). This zodiac keeps the zodiac sign-divisions roughly aligned to the twelve constellations they are named after. There are many variant methods used to obtain the commencement degree of the sidereal zodiac, so not all sidereal astrologers refer to the same point of the ecliptic in the way that tropical astrologers do. One popular method commences the zodiac from an exact (180°) opposition to the star Spica of the constellation Virgo; another ensures that the star Aldebaran of the constellation Taurus maintains a zodiac position of exactly 15° Taurus. Since the sidereal system no longer aims to consider the impact of seasonal change within its zodiacal meanings, it need not suffer the criticism that is meanings are prejudiced towards a northern hemisphere perspective. It focusses instead on the meaning of constellations and the angular relationship of the stars to each other. In fact, both systems offer an effective tool for the latter analysis, so tropical and sidereal astrologers share many astrological principles, have much to agree about, and often engage in productive discussions without any sense of essential conflict. The sidereal zodiac is the same design as the tropical zodiac in all respects except for its starting point; it also uses an equal division of the zodiac into twelve 30° signs. The alignment with visible constellations is not expected to present an exact correlation with the constellation boundaries, some of these being much larger than others in astronomical reality. Wikipedia, which allows open contributions regardless of qualification, currently reports that a "small number of sidereal astrologers do not take the astrological signs as an equal division of the ecliptic, but define their signs based on the actual width of the individual constellations". Two individuals are mentioned for proposing a zodiac which includes 13 or 14 signs to acknowledge the constellations Ophiuchus and Cetus. The report is misleading because it gives out-of-proportion focus to atypical approaches made in recent times by individuals whose work is sensational only for the way it contradicts historical practices and modern convention. Both the tropical and sidereal zodiacs present internally consistent systems. They adopt different perspectives but each has its own strength and either can be theoretically justified. Just as different languages can have their own grammatical rules that don't apply to other languages and yet still lead to the effective communication of information, astrology can be supported by different perspectives and frameworks of measurement. There are many ways in which astrologers differ on the specific details of alternate techniques, but each alternative offers its own rationale, so despite the variations being well known historically and often used in the arguments of astrological skeptics, they present no reason to consider the principles of astrology groundless or devoid of reason. 1 The BBC brands its iWonder portal as being ""the BBC's new factual and educational site" at www.bbc.co.uk/learning, published 2004; (visited, 23/03/15). 2 Text from the BBC's promotional link to the page from its iWonder public Facebook page, published 11:14 am, 21/03/15, (visited, 22/03/15). 3 The BBC's editorial guidelines and values are published at www.bbc.co.uk/editorialguidelines/page/guidelines-editorial-values-editorial-values/standard, (visited, 23/03/15). My own previous attempts to inform the BBC of historical, astronomical, and factual innacuracies in reports they offer on the technicalities of astrology has shown these guidelines to be treated as lip service only for any subject that falls outside the mainstream definition of modern science. Instead the BBC appears to adopt a civil duty to pour ridicule on subjects like astrology by any means possible, fair or foul. On the basis that modern science rejects the credibility of astrology, astrology is excluded from the expectation of accurate and balanced reporting of its principles. 4 Geminos, a Greek scientific writer of the first century B.C., provides an early definition of the width of the zodiac as 12° (Intro. to the Phenomena, J. Evans and J. L. Berggren, Princeton Univ. Press, 2006, V.53; p.157). Later astronomers, such as Al Biruni, extended this to 18° (9° either side the ecliptic) to accomodate the greater latitude of Venus. The principle of the zodiac belt being defined by maximum planetary latitudes, or "wide enough to accomodate the wanderings of the planets" is given in the 2nd century text of Achilleus, (Intro. to the Phenomena of Aratus, Maass, 1898, 53; quoted by Evans and Berggren p.157, n.28). See also reference 9, for the definition of the zodiac given by the editors of Encyclopaedia Brittanica (2014). 5 The cycle between one New Moon and the next is called the Moon's synodic cycle, the word synodic deriving from a Greek word meaning "union", because this describes successive unions of the Moon with the Sun. The average length of the synodic month is 29.53059 days (or 29 days, 12 hours, 44 minutes and 3 seconds). This is longer than the time it takes for the Moon to make a revolution around the Earth (27.3 days) because as the Moon is travelling around the Earth, the Sun is also moving forward, so the Moon must move this extra distance to catch up with the Sun. The solar year (successive returns of the Sun to the vernal equinox) contains 12 synodic lunations (354 days) with 11 days left over. Most ancient calendars, and the traditional Muslim calendar, account for this by adding an extra lunar month every three years, and a final extra lunar month every 30 years. 7 Because the starting point of the tropical and sidereal frames of measurement roughly coincided 2000 years ago, many ancient astrological sources relate the zodiac's meanings both to the fixed stars and to the seasonal cycle. As the starting points for the two methods of measurement drifted apart over time, astrologers who favoured the tropical system gave less emphasis to the former and astrologers who favoured the sidereal system gave less emphasis to the latter. (For an understanding of what the tropical and sidereal frames of measurement are, see here). 8 The Almagest, by Ptolemy edited by R. Hutchins, translated by R. Catesby Taliaferro, pp.1-479 in Vol. 16 of Great Books of the Western World. Chicago: Encyclopaedia Brittanica, Inc., 1952; VII.5, p.239. 9 See www.britannica.com/EBchecked/topic/657680/zodiac, last updated: 07/08/2014; (visited 24/03/15). zodiac, in astronomy and astrology, a belt around the heavens extending 9° on either side of the ecliptic, the plane of the earth’s orbit and of the sun’s apparent annual path. The orbits of the moon and of the principal planets also lie entirely within the zodiac. The 12 astrological signs of the zodiac are each considered to occupy 1/12 (or 30°) of its great circle. These signs no longer correspond to the astronomical constellations in which the sun actually appears. The constellations are irregular in size and shape, and the sun regularly passes through one constellation (Ophiuchus) that is not considered a member of the zodiac. 10 BBC Magazine: "Have the Zodiac and star signs changed? ", www.bbc.co.uk/news/magazine-12207811, published 17/01/11 (visited 24/03/2015). 11 N. Kollerstrom, 'Ophiuchus and the media', The Observatory, vol. 115, p. 261-262 (1995). 12 Kunkle's clarification was reported by Mad Astronomy' http://io9.com/5733004/your-zodiac-sign-may-have-changed-this-week Why did your zodiac sign change?, published 13/01/11 (visited 24/03/15). 13 Sidereal definitions of the zodiac were also historically used by some Mesopotamian, Hellenistic, Persian, and Arabic astrologers. (See also reference 7). have been hammered therein and firmly riveted…. These Vegas are believed to have been composed around 1500–1200 B.C. ; for discussion of the relevancy of the quoted passage to the use of the zodiac see The Importance of Makar Sankranti in Hindu Calendar Reform, by Patrizia Norelli-Bachelet (2010). My thanks to Lori Tompkins for pointing me in the direction of this source. ...partly because the writers make this quite clear, and particularly because from our previous demonstrations we observe that their natures, powers, and familiarities take their cause from the solstitial and equinoctial starting-places, and from no other source. For if other starting-places are assumed, we shall either be compelled no longer to use the natures of the signs for prognostications or, if we use them, to be in error, since the spaces of the zodiac which implant their powers in the planets would then pass over to others and become alienated. For an academically respected account of how Ptolemy was fully informed on the principles of precession see Gerd Graßhoff's The History of Ptolemy’s Star Catalogue, Volume 14 of Studies in the History of Mathematics and Physical Sciences, Springer Science & Business Media, 1990: 3.5 'Precession and Solar Theory', p.73. © Deborah Houlding, 24 March 2015.